Průjem - DH-norm – Back to balance. One of the symptoms of problems affecting the digestive tract is diarrhoea, which is demonstrated by repeated evacuation or the urge to evacuate one’s bowels. Diarrhoea is considered to be a situation when you have to go to toilet more than three times per day and the stool is (rather) liquid. Even if diarrhoea is often taken lightly, it is a serious issue. If the organism is dehydrated and suffering then it doesn´t have enough energy to maintain basic functions, which is the reason why untreated diarrhoea can be life-threatening for weakened individuals in extreme cases. In the case of what is known as acute diarrhoea, the onset of the disease is very fast and intensive and usually lasts for 2-3 days. It is expedient to start treatment immediately with a commonly available preparation not requiring a medical prescription. If nothing changes even then, a doctor needs to be visited in order to find out whether the diarrhoea has an infectious or non-infectious cause and for further steps to be recommended. More than 90% of diarrhoea cases are infectious and they are usually accompanied by abdominal pain, vomiting and fever, which make the risk of dehydration even higher. Quick action needs to be taken particularly in the case of small children and seniors. WARNING! It is advisable to consult a paediatrician as soon as possible in the case of infants and toddlers! The remaining 10% of acute diarrhoea is often due to the side effects of medicine, the ingestion of toxic substances or so-called traveller´s diarrhoea. Up to an unbelievable 55% of people who set out on a journey to faraway destinations in particular, which are more risky as far as diarrhoea is concerned, suffer from it. In the case of so-called chronic diarrhoea, the long duration of the illness is unpleasant. It lasts for 4 weeks or more and one needs to undergo medical tests in order to determine its cause. As it usually isn´t infectious diarrhoea, its diagnosis and subsequent treatment is more complicated than normal. The most frequent cause of long-term diarrhoea is often an illness connected with what is known as irritable bowel syndrome, which is an illness characterized by bowel movement disorders in which the diarrhoea or accompanying stomach pain has no organic cause. If you’ve “got the runs”, the first thing that you’ll probably ask yourself is what you might have eaten or done wrong. It is enough to enjoy more fresh fruit than usual, to try non-traditional cuisine, e.g. during a holiday, to not wash your hands, to not cook certain food sufficiently, and the digestive system will respond accordingly. If you rule out the simplest possible causes, there are still many remaining. What are they? Diarrhoea is often connected with the psyche. It can appear when you are nervous, stressed or suffer from anxiety. It can also appear as a side effect of food intolerance (e.g. lactose) or celiac disease (allergy to gluten in cereals) or pancreatic disease. How to treat diarrhoea correctly? The most important thing is to monitor fluid intake so that dehydration doesn´t occur. If vomiting is occurring alongside the diarrhoea, provide spoonfuls of water, weak black tea (unsweetened), non-carbonated mineral water, or possibly a rehydration solution from a pharmacy which will replace lost mineral substances and electrolytes. As far as food is concerned: with children, start with rice or carrot soup, followed by rice, dry biscuits, dry bread. You can use the same procedure for adults too, only the range of foods will expand (to include bananas, potatoes, apples) faster, depending on how the illness progresses. 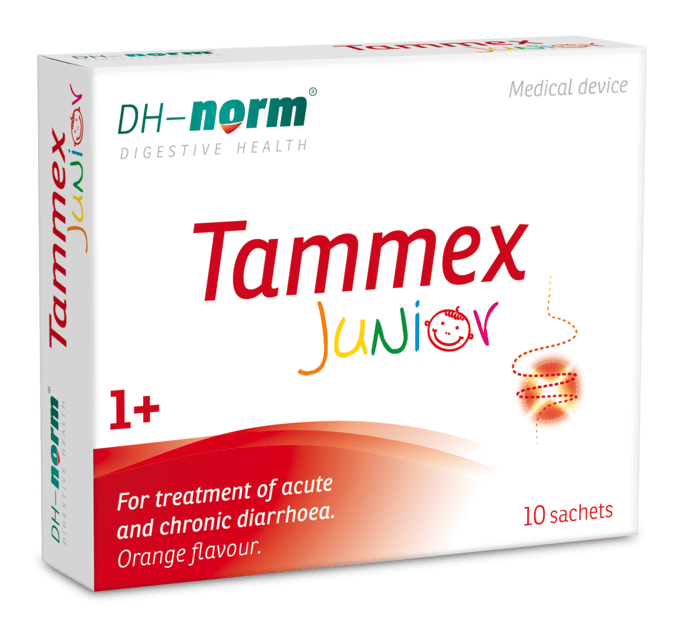 Tammex® Junior and Tammex® Family Plus, medical devices intended to fight all kinds of diarrhoea and available without prescription, are a must. Tammex® family is suitable for children from one year of age. 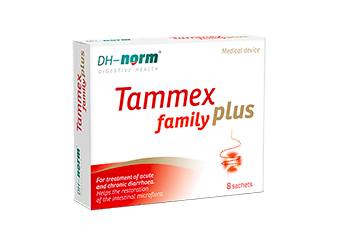 Tammex® family plus is enriched with fibre, which has a prebiotic effect and thus helps to renew intestinal microflora. Stops and treats all cases of diarrhoea regardless of the primary reason. It is suitable for children from the age of 1 year. It is presented in tasty orange flavour. Stops and treats all cases of diarrhoea regardless of the primary reason. It is enriched with prebiotic fiber to restore the intestinal microflora. It is suitable for the whole family including children from the age of 6 years.